Fred is feeling "large" in Maritime Monday 57. All the Maritime News that interesting to read. Even if you don't like to read Maritime News. Which would be small of you. Maybe you read the book The Perfect Storm by Sebastian Junger. 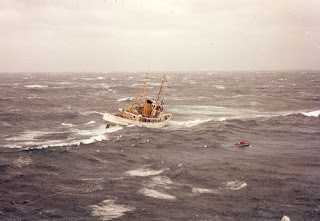 And maybe you remember that there was a Coast Guard cutter named Tamaroa out at sea trying to rescue the crew of a sail boat in big, big trouble. And maybe you've seen the photo of Tamaroa sending its rescue boat out in heavy seas (it's to the left), and maybe you just saw the standard Coastie paint scheme and didn't pay much attention to the ship itself. Well, you should have. That stout little ship took men into harm's way for 50+ years and probably paid back whatever it cost to build her several times over. She even gained some fame as the Coast Guard "submarine." Here at Midway we lost the Yorktown. We had not yet learned thoroughly the use and value of fleet tugs and salvage action. 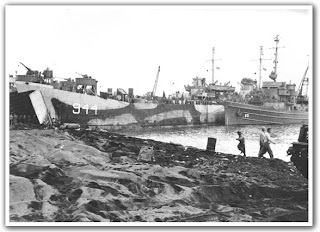 On December 20, 1944, repairs completed, Zuni towed a disabled merchant ship and troop transport to Ulithi Lagoon. On December 29, 1944, Zuni began 29 days of operation in support of Task Group 30.8, Third Fleet, off Luzin Island, the Philipines. She supported US attacks on Luzon, January 6-7; Formosa on January 3-4, 9, 15 and 21; the China coast on January 12 and 16; and Nansei Shoto on January 22. Zuni. It was during this time period that she towed the light cruiser USS Houston to safety after it got hit by two torpedoes off Taiwan. Soon thereafter, the Zuni towed the torpedoed cruiser USS Reno--they lashed the two vessels together to keep the Reno from capsizing. Probably a career for some ships, but Zuni kept going. In support of the assault on Iwo Jima, Zuni seems to have been used to propel an LST with badly needed ammo onto the beach where the ammunition could be offloaded. See here. On March 23, 1945, while assisting LST 27, Zuni's wire towline snapped and struck and killed MoMM2c James M Byres, USNR of New York, NY, and F1c Frederick F. Pavlovics, of Elizabeth, NJ. These two men are the only fatalities in the ship's long and illustrious career. With the snapped towline fouling the propellor and the anchor line disabled, Zuni broached on Iwo Jima's "Yellow" beach. The broaching broke her keel and punched a number of holes into her sides. She was towed off the beach and home for repairs. But what a record! Her wartime achievements were remarkable. In just two years time, Zuni earned four battle stars; participated in four invasions; saved two cruisers, two transports and numerous small craft and other vessels. Admiral "Bull" Halsey awarded the Legion of Merit to her skipper, Lt. Ray E. Chance. In an interesting aside, from the time of her commissioning the Zuni was underway 80% of the time. Fixed, she was decommissioned by the Navy in 1946, and commissioned as a Coast Guard Cutter. 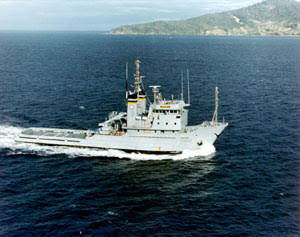 The Tamaroa had a unique reputation within the Coast Guard. She was known as the Coast Guard's only submarine due to an incident in the 60's when a crewmember opened a drydock's seacocks while the Tamaroa was getting refitted. At the time, she had several large gaping holes in her side to access mechanical repairs , she consequently sank. Today efforts are underway to preserve this ship, as set out here. On the morning of 18 January 1978, tug Cree (ATF-84) released ex-YO-129 as a target for “live” bombing practice by naval aircraft, while steaming off the coast of southern California. Cree then proceeded north to clear the target area, taking her assigned station, but mistakenly became a target when a “Navy jet aircraft” made an attack run on her at 1206, unleashing three 500 lb bombs on the ship and her crew. One bomb struck the mast and exploded in the air close aboard to starboard, showering the tug with fragments. 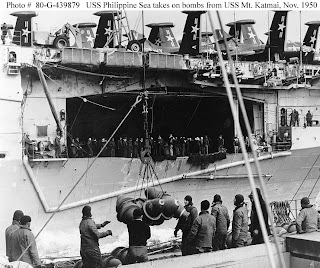 The second bomb fell along the port side, sliced beneath the ship and exploded underwater off the starboard side, “engulfing” Cree in a wall of water. The third slammed into the ship on the port bow, passing through seven bulkheads in the forward part of the ship, before becoming wedged into the passageway between the chief petty officer’s quarters and sick bay, though failing to detonate. The damage to the ship was severe, including holing of the mast, destruction of two life rafts, severing of the emergency power cable and fragment damage above the 01 Level. Below decks, the ship’s gyro was destroyed by the bomb forward, which also damaged the diving locker and bulkheads. The underwater explosion, however, caused the most serious damage, blasting several holes in bulkheads and splitting seams. Motor room B-2 became “a tangled mass of warped frames,” with equipment “wrenched from mountings and broken lines.” Flooding in excess of 2,000 gallons per minute was reported. A salute to their crews and the work they did. In today's Navy, Military Sealift Command operates four ATFs. UPDATE: More on the towing of U-505 here. 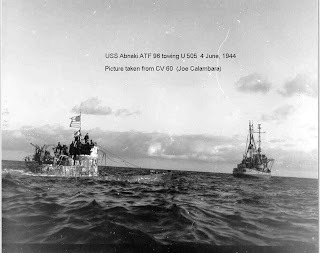 Under tow toward Ulithi Atoll after she was torpedoed while operating off Okinawa. 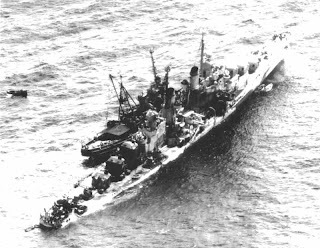 USS Houston (CL-81), also torpedoed and under tow, is in the right background. Canberra was hit amidships on 13 October 1944. 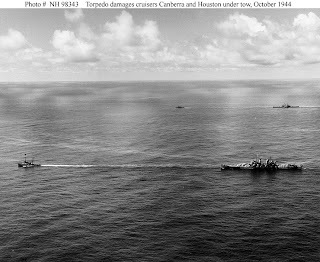 Houston was torpedoed twice, amidships on 14 October and aft on 16 October. The tugs may be USS Munsee (ATF-107), which towed Canberra, and USS Pawnee (ATF-74). 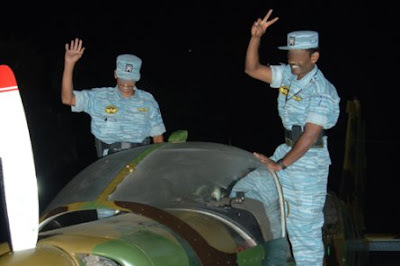 Tamil Tiger planes struck fuel depots around Sri Lanka’s capital early today, briefly plunging Colombo into darkness and sending cricket fans watching the World Cup final running for cover. As explosions were heard and the night sky lit up with anti-aircraft fire, fans scrambled to leave parks and hotels where giant screens showing Sri Lanka playing Australia in the final in Barbados were switched off. 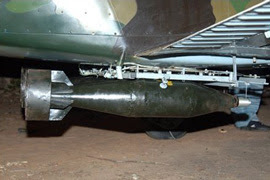 The defence ministry confirmed that the two facilities - one state-owned and the other run by the multi-national Shell - were hit by four Tiger bombs, but only two exploded at the Shell depot. The ministry said the bombs damaged fire fighting equipment and the water supply system at the Shell facility, but the damage was “minor." 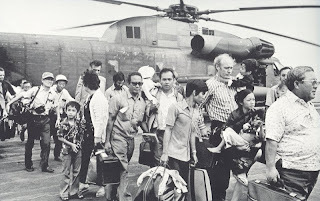 The planners anticipated they would be moving about 100 people out of Saigon, but when it was over, they had relocated 1,373 Americans and 5,595 foreign refugees. 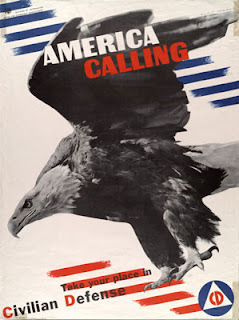 There came a point during the night when the order was given to only take American citizens because the North Vietnamese Army and Viet Cong were getting close to the DOA compound and American Embassy. "I can't imagine what it must have been like to have to look at those people, knowing that if they were caught they'd probably be killed," Buckel said. "As good a feeling as it must've been helping the ones they could, there also had to be a little bit of guilt there too." 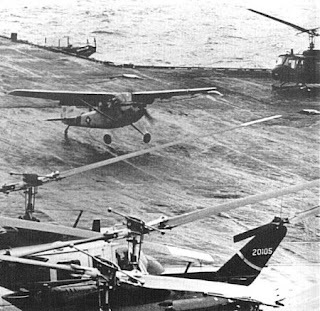 And from Midway Sailor are pictures of part of the evacuation, including the pushing of a helicopter off the deck so a light plane could land. 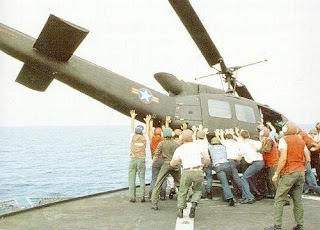 Thirty years ago I was fortunate enough to take a photograph that has become perhaps the most recognizable image of the fall of Saigon - you know it, the one that is always described as showing an American helicopter evacuating people from the roof of the United States Embassy. Well, like so many things about the Vietnam War, it's not exactly what it seems. In fact, the photo is not of the embassy at all; the helicopter was actually on the roof of an apartment building in downtown Saigon where senior Central Intelligence Agency employees were housed. More on what happened after here. When the convoy was maneuvering in Lyme Bay in the early hours of April 28, they were attacked by nine German E-boats out of Cherbourg that had evaded the Allied patrols. No warning of the presence of enemy boats had been received until LST-507 was torpedoed at 0204. The ship burst into flames, and survivors abandoned ship. 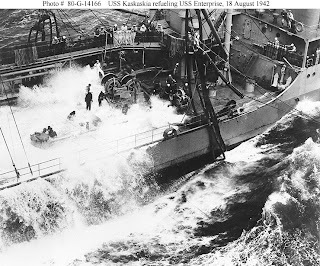 Several minutes later LST-531 was torpedoed and sank in six minutes. LST-289, which opened fire at E-boats, was also torpedoed but was able to reach port. The other LSTs plus two British destroyers fired at the E-boats, which used smoke and high speed to escape. This brief action resulted in 198 Navy dead and missing and 441 Army dead and missing according to the naval action reports. Later Army reports gave 551 as the total number of dead and missing soldiers. 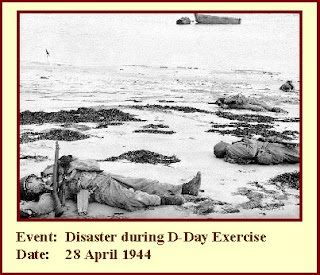 It was the costliest training exercise in all of World War II. As the bodies washed ashore in days ahead, the official count rose to 749. The brave men who died that day contributed to the success in France six weeks later. Indeed their sacrifice was a Prelude to Victory. Two foreign transgressor vessels have been detained in Russia’s territorial waters near the Sakhalin Island during a special border operation under the codename Typhoon-2007, ITAR-TASS reports. The Bonsei Maru schooner flying the Belize flag intruded Russian territorial waters in the La Perouse Strait separating Sakhalin from the Japanese Hokkaido Island on Tuesday. The schooner was detained and is being convoyed to Nevelsk port for an investigation, the public relations group of the Sakhalin coast guard department of Russia’s Federal Security Service (FSB) reported. control over seafood catches in the Tatar Strait. Three patrol gunboats are patrolling the area and an Antonov-72 plane of the aviation detachment of Russia’s FSB is conducting aerial monitoring of the strait’s water area. More on FSB here. 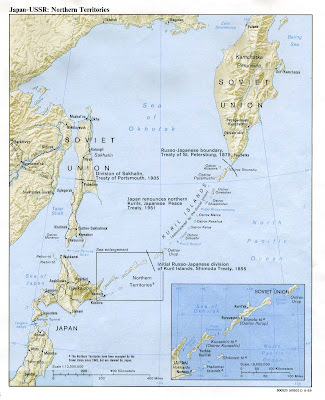 Some background on the dispute between Russia and Japan over territorial waters here. A Chinese fishing boat and its 18 crew disappeared in the South China Sea shortly after its captain reported pirates had boarded his vessel, Xinhua news agency reported on Saturday. The captain of "Qionghai 08099" phoned his family on Thursday morning saying his boat was being robbed by armed pirates after experiencing mechanical problems near the Spratly Islands, a Hainan provincial official was quoted by Xinhua as saying. Local marine officials from China's southernmost province of Hainan dispatched a coast guard ship and mobilized other fishing vessels to aid in the search. Captain Xu Demin first called his wife saying a group of unidentified men were robbing his boat. Twenty minutes later Xu phoned a cousin, saying that the robbers had left with his catch of fish, but that another unidentified vessel was approaching. The family has had no further contact with Xu since the second call, according to the report. 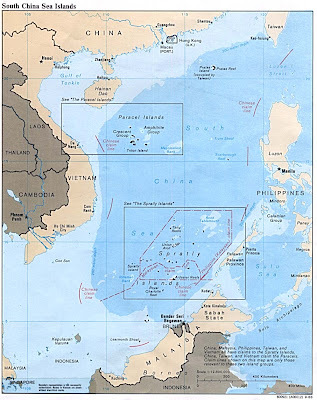 The Spratly Islands are a string of tiny islands in an area that is claimed all or in part by by China, Vietnam, Taiwan, Brunei, Malaysia and the Philippines. As always, clicking on the map will make it bigger. Foreign Minister Abdullah Gul - the ruling Islamist-rooted AK party (AK) candidate, marginally failed to gain enough support for his bid. The secular opposition has said it will challenge the election in court because not enough deputies were present. In an unusually strong statement, the Turkish Armed Forces say it is the defender of the republic's secular system. “It should not be forgotten that the Turkish armed forces are a side in this debate and are a staunch defender of secularism. "When necessary, it will display its attitudes and actions very clearly. No one should doubt that,” the statement says. The Turkish Army has intervened in governmental matter before, in 1960, 1971, and 1980. Unlike many such interventions in some other countries, the military has been consistent in restoring democracy after each such event. 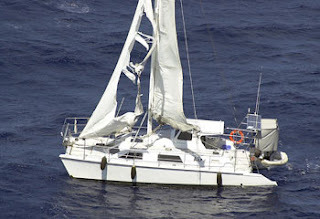 Update: Aussie yacht mystery-weather not cause? THE strongest winds had passed the area where three WA men who disappeared off the north Queensland coast were sailing when they made their final radio call. Bureau of Meteorology records for the region show that while wind speed was 20 knots at 9am on Sunday, April 15, and the next day, the winds peaked at 46 knots at about 5pm, nearly two hours before the final recorded call at 6.45pm. Further records show that winds were consistently around this mark from about 1pm on that day, although there is no record of any rain or other events to indicate a storm. The strong winds also meant there was a high degree of visibility in the waters. Queensland Volunteer Marine Rescue yesterday defended itself against allegations it was slow in informing police the men had radioed their position at 6.45pm on the day they left Airlie Beach, hours after police initially thought they had gone into the water. 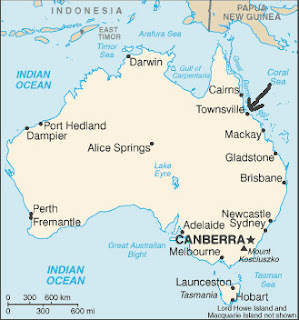 The Australian revealed this week the VMR told police about the radio contact only on Monday, causing anguish to the families of the missing men who are continuing their own search of waters between Airlie Beach and Townsville. Previous posts here, here, and here. Saudi Arabia has arrested more than 170 suspected al Qaeda-linked militants, some of whom were training as pilots to carry out suicide attacks on oil facilities in the kingdom, the Interior Ministry said on Friday. The ministry, in a statement read on state television, also said police seized weapons and more than 20 million riyals ($5.33 million) in cash, from what Al Arabiya television said were seven armed militant cells. "Some had begun training on the use of weapons, and some were sent to other countries to study aviation in preparation to use them to carry out terrorist operations inside the kingdom," the statement said. "One of their main targets was to carry out suicide attacks against public figures and oil installations and to target military bases inside and outside (the country)," it added. 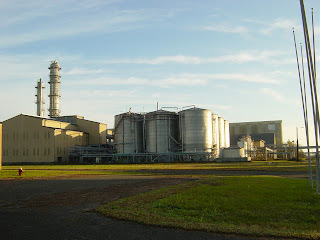 Ethanol is widely touted as an eco-friendly, clean-burning fuel. But if every vehicle in the United States ran on fuel made primarily from ethanol instead of pure gasoline, the number of respiratory-related deaths and hospitalizations likely would increase, according to a new study by Stanford University atmospheric scientist Mark Z. Jacobson. His findings are published in the April 18 online edition of the journal Environmental Science & Technology (ES&T). "Ethanol is being promoted as a clean and renewable fuel that will reduce global warming and air pollution," said Jacobson, associate professor of civil and environmental engineering. "But our results show that a high blend of ethanol poses an equal or greater risk to public health than gasoline, which already causes significant health damage." University of Michigan site discussing "net energy balance" of ethanol here. The most contested property of Ethanol is its Net Energy Balance, the energy ethanol provides minus the energy used to make ethanol. We will calculate our estimate of the net energy balance through this research. It is important to note that the NEB of Ethanol or any other fuel that is burned cannot be positive (Patzek 2006). The Second Law Of Thermodynamics implies that any energy conversion, solid to liquid to gas for ethanol, results in a negative net energy balance. The same applies for gasoline (liquid to gas). The question becomes whether the external benefits of ethanol relative to gasoline, less pollution and domestic production, justify the negative pre-externality NEB. Many complicated choices influence the calculation of Ethanol’s NEB. For example, the benefits of less pollution and an increase in US domestic production make ethanol more rational than gasoline – but how much do these count for energy credits when calculating ethanol’s NEB? Now, take the assumption of the "benefits of less pollution" out of the equation or modify by new knowledge and how's the NEB do? Factories that convert corn into the gasoline additive ethanol are releasing carbon monoxide, methanol and some carcinogens at levels "many times greater" than they promised, the government says. Volatile organic compounds (VOCs) being released by the ethanol plants include formaldehyde and acetic acid, both carcinogens. Methanol, although not known to cause cancer, also is classified as a hazardous pollutant. The fumes are produced when fermented corn mash is dried for sale as a supplement for livestock feed. Devices known as thermal oxidizers can be attached to the plants to burn off the dangerous gases. Recent tests have found VOC emissions ranging from 120 tons a year, for some of the smallest plants, up to 1,000 tons annually, agency officials said. It isn't known whether the chemicals are hazardous to nearby residents, they said. When the plants were built, many reported VOC emissions well below 100 tons a year, allowing them to bypass a lengthy and stringent EPA permitting process. Plants with emissions above 100 tons annually are classified as "major sources" of pollution under the Clean Air Act and are more heavily regulated. States started measuring VOC emissions at ethanol plants about a year ago following complaints of foul odors. One small facility in St. Paul, Minn., had to install $1 million in pollution control equipment to reduce the emissions. "To the extent that this new test procedure is identifying new VOC emissions, the industry has certainly agreed to address those," said Bob Dinneen, president of the Renewable Fuels Association, the recipient of EPA's letter. A Clovis resident fears a new law lowering air pollution standards for ethanol plants sets a bad precedent. Clovis resident Frank Dottle, an organizer of a local group that opposes construction of a plant just west of Clovis that would produce 108 million gallons of ethanol a year, felt the new standards would allow the company to make more money by producing more of the fuel additive at the plant, and that would create more pollution. The Environmental Protection Agency modified the definition of “chemical process plants” earlier this month. According to the EPA’s Web site, the change for ethanol plants was made because creating ethanol for human consumption and as a fuel source are generally similar processes. The new standards would allow 250 tons per year to be emitted in pollutant categories, up from 100 tons annually. ConAgra Trade Group Spokesperson Melissa Baron said at this point, the EPA’s changes won’t affect the Clovis Ethanol plant, which would process corn into a fuel additive. The plant would be located about three-tenths of a mile from Clovis city limits off U.S. 60/84. A NEW information centre able to track ships in the Gulf and prevent unlawful activities such as illegal dumping will open before the end of June, it was revealed yesterday. The Oman-based centre will have offices in every GCC state to share information and enable authorities in each country to know details about the ships that dock at their ports. General Organisation of Seaports (GOS) maritime affairs director Essa Yateem said that inspectors at each port would send information, such as the amount of oil and cargo carried by ships and whether or not there is a need for repairs, to the central information centre. "The centre will then pass this on to other ports, enabling the vessels to be tracked port by port," he said. "If, for example, a ship was found to be in need of certain repairs at one port and for some reason these repairs were not available, it wouldn't be able to bypass the next port because they will already know about it. "This could prevent serious incidents." Mr Yateem said that the illegal dumping of oil and wastes into the Gulf waters would also be minimised. The United States has arrested Karunakaran Kandasamy alias Karuna, a Tamil of Sri Lankan origin, on the charge of being the kingpin of a major racket to provide financial and material support to the LTTE, a banned organisation in the States. A US embassy release said on Thursday that Kandasamy, arrested in Queens New York, was drawing on "America's financial resources and technical advances to further the war of terror in Sri Lanka and elsewhere." "We refuse to allow this to continue," the US Attorney, Roslyn R Mauskopf, told the District Court in Brooklyn on Wednesday. The LTTE was treating the US as a major source for money, arms and military technology, the embassy release said. Somalia woes: It's the fault of the U.S.? Funny how the UN never gets blamed for anything. "Genuine multilateral concern to support the reconstruction and rehabilitation of Somalia has been hijacked by unilateral actions of other international actors -- especially Ethiopia and the United States -- following their own foreign policy agendas," the report from the Chatham House foreign affairs think-tank said. The installation of a new Somali government in early 2007 with Ethiopian backing and US support to counter a rise in Islamism, plus the arrival of African Union peacekeepers, was "highly provocative", it said. Perhaps Chatham House should put some people on the ground to help make it all better. I have not been posting on Somalia recently because, quite frankly, the reporting on the situation there has been awful. Now, however, appears this headline Somalia says it has defeated insurgents. Somalia's prime minister claimed victory Thursday over Islamic insurgents in Mogadishu, where nine days of battles using tanks and artillery left hundreds dead. Western diplomats were skeptical of the claim. The diplomats, who spoke on condition of anonymity for fear of damaging relations with Somalia's interim government, said the insurgents had suffered many casualties and were running low on ammunition, but were not yet defeated. 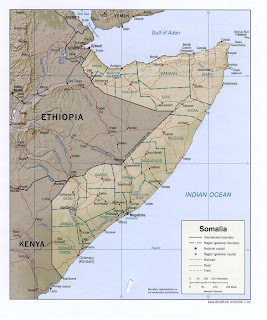 The militants reject any secular government, and have sworn to fight until Somalia becomes an Islamic emirate. I hope it's true, and also hope that the West is smart enough to provide immediate aid to Somalia as part of a plan to revive Somalia. Congress and the American people need to under­stand that while the United States has made progress in putting missile defense systems in the field in recent years, in most respects the U.S. remains vul­nerable to this threat. This is no time for the U.S. to slow the pace of developing and deploying effective defenses against ballistic missiles. Indeed, the Bush Administration and Congress need to accelerate the effort by focusing on developing and deploying the systems that offer the greatest capability. Further, the change in party control in Congress has put a number of missile defense skeptics in lead­ership positions. For example, Senator Carl Levin (D– MI), the new chairman of the Senate Armed Services Committee, has stated that he considers it a mistake to buy missile defense interceptors before they have proven themselves in operational tests. This seem­ingly anodyne statement actually reveals his inten­tion to stop many missile defense activities, because the interceptors and other elements of the defense must be purchased and fielded in order to be tested. 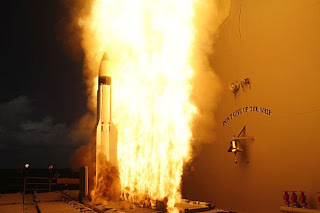 As of July 2006, 11 Aegis destroyers had been upgraded to track ballistic missiles in flight. While an incorrect system setting blocked a test of the Standard Missile-3 on December 7, 2006, prior to that test, the Standard Missile-3 performed suc­cessful intercepts in seven out of eight attempts. At this time, three cruisers and three destroyers are capable of engaging short-range and medium-range ballistic missiles in the midcourse stage of flight with the Standard Missile-3. 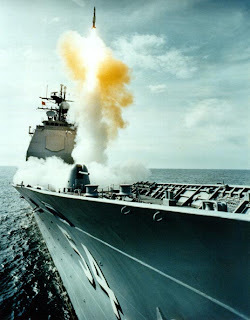 Finally, the Navy successfully tested the existing Standard Missile-2 Block IV against a short-range target missile in May 2006. 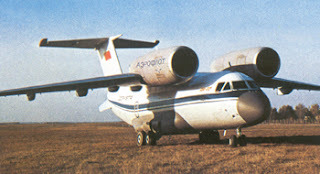 During the test, this system destroyed the incoming missile in the terminal phase of flight. In the near term, lesser missile powers, maybe including terrorist groups, could attack U.S. terri­tory by launching a short-range Scud missile from a container ship off the coast. Congress should express its concern about this threat and direct the Navy to take steps to counter it. But in reality the risks to maritime flows of oil are far smaller than is commonly assumed. First, tankers are much less vulnerable than conventional wisdom holds. Second, limited regional conflicts would be unlikely to seriously upset traffic, and terrorist attacks against shipping would have even less of an economic effect. Third, only a naval power of the United States' strength could seriously disrupt oil shipments, but the United States is more likely to protect shipping on the high seas than to do anything to endanger it. Fourth, if any country attempted to interfere with international shipping, a coalition would inevitably form to keep traffic flowing with manageable damage to oil deliveries and the global economy. finally, although all-out wars between major powers can seriously disrupt maritime shipping, the chances of such a conflict happening in the foreseeable future are remote. The quoted selection is from a preview sectton of the entire article which must be purchased from Foreign Affairs as a pdf. More on this later, though my initial reaction is that the point is well taken, though it seems to me that there are possible temporary disruptions at certain choke points that can cause "minor" disturbances in the flow of oil. Note the Admiral Blair and the Professor use the terms "seriously upset traffic" and "seriously disrupt." Update: About sea lanes here. 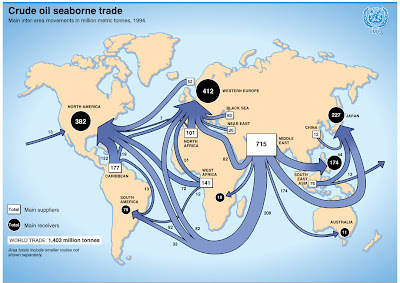 Added graphic which is an IMO product showing seaborne oil routes in 1994. Allies and friends. John has it covered here. Brown said not long after the 747th put in the well, they had to go back to the well site and change it to a solar-powered well. Due to climate and the area, Brown said the well stopped working and people passing through the site tried to fix it themselves and ended up damaging it beyond use. Because the well was broken, people were drawing water from a local oasis. An oasis is a stream of water that comes up from the ground. The people dig through the ground surface and the water seeps up through the dirt. The oasis is the only source of water for travelers and their animals with the well being damaged. He went on to explain the process involved to fix the well. The team surveyed the site in order to determine what type of equipment they would need, how many people the project required and to test the water in the area. According to Sgt. Maj. William Lee, the Mud Hog’s project manager, the oasis runs through an ancient camel trail that spans from one side of Ethiopia to another, with Djibouti being in the middle. “The problem with the oasis is that it is open to the environment, there is nothing to protect the water from bacteria,” said Brown. “The animals use the bathroom in the water and their feces sit there and create all sorts of bacteria. Travelers bathe and drink from the water because they have no other choice. They then continue on their journey, spreading disease that they contract from the oasis.” Lee said because of this reason, fixing this particular well in the area was a top priority in order to protect the people and keep from spreading disease. With the well complete and the water clean, people will go to the well for water instead of the oasis. The team also created a trough that runs down away from the pump on the well so that any excess water will run down and fill a trough for animals to drink out of. Although Brown and his team of well drillers successfully bettered the lives of thousands of villagers, the work does not stop here. “We are always out and about throughout the area and we plan on checking up on the wells one way or another,” said Brown. From the lyrics of Cool Water"
2.04.2007: 0750 UTC: Posn 20:38.7N - 059:17.0E, 20 nm NE of Masirah Island, Oman. Three pirates, wearing face masks, in a white coloured speedboat approached a LPG tanker underway. They attempted to board from the stbd quarter using grappling hooks attached to ropes. While the pirates were attempting to board there were three other speed boats at a distance of 1 nm following the ship. Ship raised the alarm; crew mustered and took evasive action. Pirates aborted their attempt and moved away. 6.04.2007: 1630 LT: Posn: 07:58.36S - 116:33.01E, Bennette Bay, Indonesia. Robbers armed with guns in 10 speed boats fired shots and attempted to board a general cargo ship at anchor. Ship owners contacted the Piracy Reporting Centre (PRC) and asked for assistance. PRC contacted the Indonesian SAR and Navy HQ who acknowledged and informed the PRC that they have relayed the message to the local authorities to render necessary assistance. Meanwhile, master took evasive action by heaving anchor and proceeding to sea. Later the master informed PRC that three police personnel had boarded the ship. No one was injured. 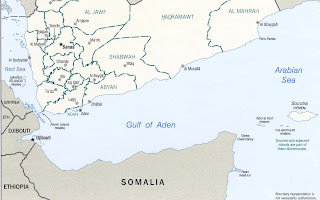 Arrow on map points to Masirah Island, off Oman. attempted boarding incident reported the day before (UKMTO). In January, the Navy placed a 90-day stop-work order on one LCS, after costs far exceeded its initial $270 million price tag. After weeks of negotiations, the Navy canceled the company's second multimillion-dollar ship earlier this month. A March 30 report by the Government Accountability Office also detailed cost and weight issues on a newly redesigned presidential helicopter raising further concerns on Lockheed's management of military programs. Company officials appeared unfazed by the string of negative headlines, and touted the numerous multimillion-dollar, multiyear defense contracts secured this quarter. CIBC World Markets Corp. research analyst Myles Walton expects the defense contractor to report a good quarter, and said results could beat estimates by 10 cents per share. Walton estimates Lockheed will report net income of $1.36 for the quarter. 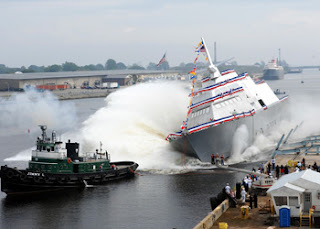 "We don't expect financial impact from the LCS cancellation, though it is one of the first public performance blemishes on the company in some time," Watson said in a client note. A Lockheed Martin executive on Tuesday bristled at the Navy's growing interest in fixed-price contracts for new military programs, saying the money-saving strategy could backfire by reducing the quality of the work performed. Lockheed has repeatedly blamed cost overruns on LCS on revised Navy requirements and delays in getting material from subcontractors. As I have previously noted, the PRC reports include any reported boarding of a ship including climbing up the anchor chain and grabbing small items. Benjamin Cardin and Barbara Mikulski recently introduced in the US Senate. shores under the Deepwater Port Act. opposition to the Sparrows Point project. 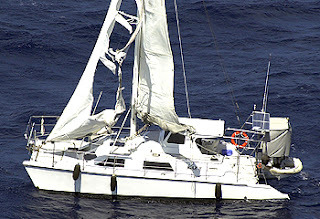 RELATIVES of the skipper of a mystery yacht found off the coast of north Queensland believe they have a spiritual link with the missing man, that he may have been kidnapped and is still alive. Hope Himing, niece of Derek Batten, 56, said today there were many unusual circumstances surrounding the yacht, which was found off the coast of Townsville last Wednesday. Ms Himing said she and her mother had both felt spiritual contact from Derek, whom they believed was still alive but fighting for his life. "My mum and I are both Spiritualists. My mum's had a really strong feeling from Des that he's somewhere dark and he can't see and I don't feel that he's dead either," Ms Himing said. "I don't think he's got a lot left in him but I actually don't think he's dead, and so everything we can do to get (people) out there looking again is a huge thing." Arrow on map points to general vicinity of yacht when found. Don't kidnappers generally contact the families and demand something - like, oh, say, ransom? Wouldn't they take valuables, just like pirates would? Previous post (with an update) on this mystery here. The LT Robert “Bob” Threlkeld was the Engineer Officer on CARR. CDR Johnson told him to get in the whaleboat, go over and find the CO of the BONEFISH, CDR Wilson, and bring him back aboard. Bob did. He told me he climbed aboard the sub and walked among the crew until he found the CO. He noted the smoke coming from the hatches was the worst thing he had ever smelled. Three men died, but, as noted in the piece, without a courageous decision by the sub's CO, it could have been much worse. The push for greater use of ethanol, now made from corn but presumed to be produced from switchgrass and other cellulosic sources in the future, has been framed largely in the context of a need for greater energy independence from imports. But so has the need for more domestic refineries. Some Republican lawmakers have cited the shortage of U.S. refining capacity as one reason for high gasoline prices, and the recent run-up in gasoline costs has been partly linked to unexpected refinery shutdowns. No new U.S. refinery has been built since the 1970s. And while larger refineries have been expanded, U.S. demand for gasoline consistently requires some imports. "Why would I invest in a refinery when you're trying to make 20 percent of the gasoline supply ethanol?" Robertson said Chevron supports expanded use of ethanol and is "not in any way threatened" by the corn-based fuel. "But it has implications for investments in the United States in refining," he acknowledged, because less gasoline will be needed. Each spring, just before the summer driving season, gasoline prices skyrocket. And every year, these four words appear in news reports nationwide as a big reason for the runup: "lack of refining capacity." Then experts call for more refineries, politicians pledge to make the dirty behemoths easier to build, but guess what? Nothing really happens. Next year, repeat story. So why hasn't a new refinery been built in the U.S. since 1976? "There have been calls every year this decade for new refining capacity, yet no new projects initiated," said Geoff Sundstrom, a spokesman for AAA, the motorist organization. "Refining capacity has not kept pace with demand for gasoline." And, it looks like that trend will continue. "Consumer demand just continues to grow, and we can't grow as fast at the refining level," said Charlie Drevna, executive vice president at the national Petrochemical and Refiners Association, which includes companies like Valero (Charts), ExxonMobil (Charts), Chevron (Charts), and ConocoPhillips (Charts). "But there are plenty of economic reasons why that hasn't happened." First off, experts note, gasoline, like any commodity, is subject to big price swings. After all, in the late 1990s it was selling for less than $1 a gallon, hardly an encouraging number if you're a refinery exec looking at making a decades-long, multi-billion dollar investment. While retail gasoline prices are currently near record highs at just below $3 a gallon, where they might be five years from now is a matter of debate. Some experts say new investment, in both alternative energy and conventional sources, will boost supply and could cut prices in half. If a global recession hit, the drop could be even more dramatic. Others say rampant demand, especially in the developing world, will keep prices from going anywhere but up. For an oil executive trying to decide on a refinery investment, picking who's right is a tough call. Secondly, stringent environmental laws and effective community organizing have made it very difficult to build a new refinery in the U.S.
"Everyone is quick to say "look at these refiners, they're driving up the price,'" said Phil Flynn Flynn, senior market analyst at Alaron Trading in Chicago. "But if I wanted to build a refinery tomorrow, I couldn't do it." And then there's the public's newfound concern over global warming and its supposed commitment to do something about it. President Bush himself has called for a 20 percent reduction in gasoline use over the next 10 years. "What refining executive in their right fiscal mind would say, gee, we need to add refining capacity right now," said Drevna at the refiners' association. A primer on refining here. The call occured just after the release of the study by Stanford University atmospheric scientist Mark Jacobson projecting significant increases in some atmospheric pollutants should ethanol use continue to increase. Cavaney is concerned that for the industry, the increased use of ethanol is going to wind up in another round of lawsuits just like those the industry faces because of the use of MTBE. Cavaney said that during the move to reformulated gasoline, when it was clear that Mtbe was going to be an all but mandated additive, the industry said to the federal government, "If youre going to embrace something this big, you need to take a look at it." API's fear is that such a review won't happen in the rush to use more ethanol, and if air quality decreases as a result, the lawsuits against the companies that have blended ethanol will be targets of a new round of litigation. "So I think maybe what this Mark Jacobson study may well do is help serve as a bit of catalyst to make sure that we do take a good look at this so we fully understand what the results are going to be, regardless of whether hes correct or not," Cavaney said. Cavaney's skepticism toward ethanol -- not cellulosic, but corn-based -- comes through clearly. "The energy content is only about 25 percent less than it would be if you used regular gasoline," Cavaney said. "In the many years Ive been in this industry, I have never had a consumer, an elected official, tell me that I want to pay more for my fuel and I want to get less miles per gallon, and thats exactly what you get when you buy E85." The entire transcript is available here. Full disclosure: I will, someday (God willing and the creek don't rise), receive a couple of retirement checks from energy companies, including Chevron. 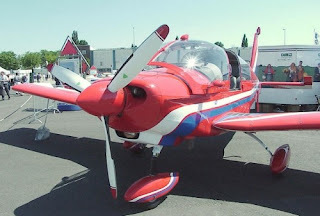 The rebels said they used two aircraft and insisted Palaly base was hit. The air force said there was one plane and it had stopped it reaching its target. Experts say the Tigers could have as many as five light aircraft, smuggled into the country in pieces to be assembled in jungle bases. Claims and counterclaims of success are typical of this struggle in which thousands have died and both sides have well-honed media systems. Report of initial attack in March here. Photos are from first attack "celebration." You have until 4/27/07 to register for the 2007 MilBlog Conference. Man, there are some impressive folks signed up - see here. I wonder where my old autograph book has gone? Mukundan said a new problem posing a risk to seafarers was the rise in incidents of hostage-taking and kidnapping. "It is a worrying trend, especially in Somalia and Nigeria," he said, referring to incidents in the first three months of 2007. He declined to elaborate. The IMB will release its first quarter piracy report on Tuesday. Mukundan said last year 263 crew were taken hostage or kidnapped worldwide, adding that three people had not been recovered, "believed to be killed." Mexico, one of the United States' biggest trading partners, is attracting special attention not only because many goods produced in Mexico are moved through the country's ports but also because some Mexican ports process Asian goods bound for the United States. 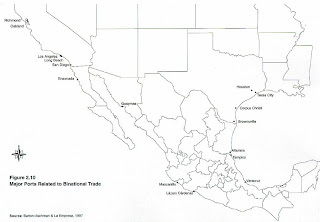 Lázaro Cárdenas, on Mexico's west coast with a direct rail line to the Texas border, is receiving more Asian cargo from shippers seeking an alternative to the busy U.S. ports of Los Angeles and Long Beach. Four Mexican ports – Altamira, Veracruz, Manzanillo and Lázaro Cárdenas – will receive radiation-detection equipment under the plan announced last week. According to Mexican media reports, the value of the equipment, maintenance and training amounts to between $30 million and $50 million. A U.S. government representative would not comment on the amount. Plans are under way to develop a megaport at Punta Colonet, 150 miles south of San Diego. 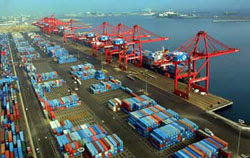 The port is expected to be the size of the Los Angeles and Long Beach ports combined. Millions of cargo containers from throughout Asia are expected to be off-loaded at this new port each year, transferred to rail cars and shipped across the U.S.-Mexican border, probably at Yuma, Ariz.
Security expert Flynn said the biggest opportunities come at the factory or when the load is being carried miles cross-country to a port. 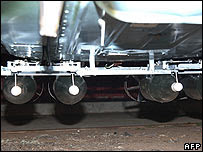 The possibility of tampering also exists whenever the container is shifted to another mode of transport, such as when cargo boxes are transferred from ships to trucks or rail cars at intermodal facilities. Once again, Fred's doing the "heavy lifting" on maritime matters at Fred Fry International: Maritime Monday 56. In my post here, part of the discussion was devoted to the SIRIUS dog sledge patrols of that island. Reader Richard Evans, a retired Navy guy, works in Greenland, at Thule AIr Base (about which more here) conveniently located "695 miles North of the Arctic Circle, and 947 miles south of the North Pole on the Northwest side of the island of Greenland. 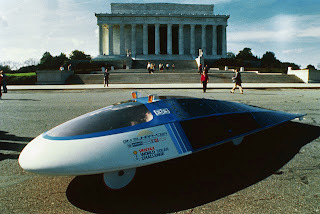 The base is approximately 550 miles east of the North Magnetic Pole." Richard sent me a link to some of his photos of the area which is http://community.webshots.com/user/polarbearbait. Thanks, Richard! Go visit his photos! We experience twenty-four hours of sunlight from early April until late August. Total darkness usually starts around the third week of November and can last until the first brief sunrise, in February. Our winter storm season runs from 15 September through 15 May; however, we have experienced severe storms during every month of the year. During the brief summer months, the storms are normally high winds with little or no precipitation. During the winter months, storms are at best very challenging and must be taken seriously. We do provide parkas and other storm gear for our visitors, and everyone should bring a warm hat. 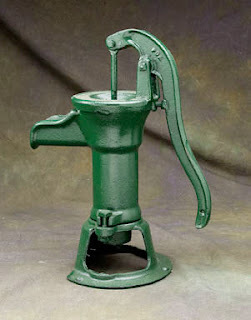 Sunday Ship History: "Beans, Bullets, and Black Oil"
This is not a study in logistics. It is more a story of logistics. It is a story about the logistic services supplied to U.S. naval forces in the operating areas in the Pacific, 1941-45. It is largely an account of services rendered by means of floating facilities. It does not go into the magnificent production and supply by the industrial plants, shipyards, and naval bases of continental United States and hawaii which made possible the floating bases of distribution and maintenance. This is a story of the support of the fleet into the far reaches of the Pacific in its campaign against the Japanese. It is the story of the distribution to the fleet of the sinews of war, at times, at places, and in quantities unsuspected by the enemy until it was too late for him to do much to oppose it. This book has little or nothing to say about the building, equipping, and fitting out of new vessels, or the manufacture and shipping of the thousands of tons of thousands of different items by continental sources, without which colossal accomplishment there could have been no drive across the Pacific. This account does not attempt to furnish complete statistical figures; such statistics are matters for the technical bureaus of the Navy. This is, rather, an attempt to spin a yarn of the logistics afloat in the Pacific Fleet, in order that those interested in naval history may realize that naval warfare is not all blazing combat. 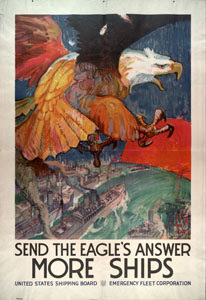 A history of the sum total of American logistics during World War II would be forced to cover a tremendous field. The present volume deals only with naval logistics in the Pacific. As such, its scope is limited to a not-too--great portion of our entire national logistic effort. However, the area involved--the Pacific Ocean--is the one where our maximum naval effort was expended. Distances in that ocean were very great, and the resources available to us form friendly countries in the Western Pacific were comparatively minor, in both variety and quantity. Nearly everything our forces required had to come form or through the United States, with the exception of the large amounts of petroleum products originating in the Caribbean area and moving west through the Panama Canal. The study of our naval logistic effort in the Pacific, as outlined in the present volume, brings out our dependence on both shore bases and mobile floating bases such as are exemplified by Service Squadron Ten. Each had its advantages, and neither alone could have done the job. The growth of Service Squadron Ten, its movement across the Pacific to successive bases at Eniwetok, then Ulithi and then Leyte, and its continuous and most efficient service to the fleet at these and numerous other bases where it stationed ships and representatives as our operations demanded, are achievements of which all Americans can be justly proud, but about which most of them have little or no knowledge. From 7 December1941, when the Japanese attacked Pearl Harbor, until they admitted defeat in August 1945, our fleet continuously grew. During those stirring and difficult times, the accounts of ship actions, air strikes, and amphibious operations make up the thrilling combat history of the Pacific theater. 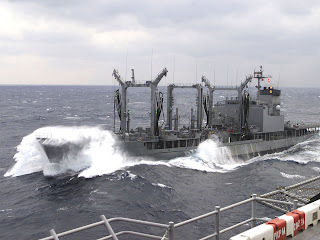 Linked inseparably with combat is naval logistic support, the support which makes available to the fleet such essentials as ammunition, fuel, food, repair services--in short, all the necessities, at the proper time and place and in adequate amounts. This support, from advanced bases and from floating mobile service squadrons and groups, maintained the fleet and enabled it to take offensive action farther from home supply points than was ever before thought possible, and this is the story which will be told here. Fueling under way at sea was then looked upon somewhat as an emergency stunt which might have to be resorted to in wartime, and therefore probably required occasional practice. Few ever thought it would become so routine a matter that it would be accomplished with ease in all kinds of weather except gales. And how the Service Force grew! In 1940 the Base Force Train included a total of 51 craft of all types, among them 1 floating drydock of destroyer capacity. By 1945 the total was 315 vessels, every one of them needed. 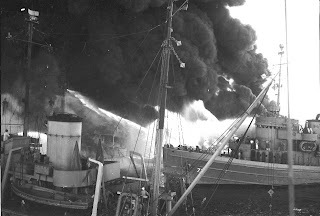 The 14 oilers which were all the Navy owned in 1940 had leaped to 62, in addition to merchant tankers which brought huge cargoes of oil, aviation gasoline, and Diesel fuel to bases where the Navy tankers took them on board for distribution to the fleet. No less than 21 repair ships of various sizes had supplanted the 2 the Navy had 5 years before. 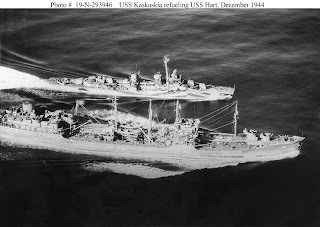 The battleships had 3 floating drydocks, the cruisers 2, and the destroyers 9, while small craft had 16. Hospital ships had risen from 1 to 6, and in addition there were 3 transport evacuation vessels, while the ammunition ships numbered 14, plus 28 cargo carriers and 8 LST's (Landing Ship, Tanks). There were 305 planes in the Utility Wing. The total of personnel was 30,369 officers and 425,945 enlisted men, or approximately one-sixth of the entire naval service at the peak of the war. Every ship required a trained crew to man the engine rooms, the guns, chart the courses, load the "beans, bullets and black oil" and then deliver them to the rest of the fleet. And every base required sailors to function. At the time of the Japanese Attack on Pearl Harbor, Rear Admiral W.L. Calhoun commanded the Base Force (NB E1-during the war the Base Force became the Service Force), the there and had his flag in the U.S.S. Argonne. Overnight his duties increased enormously. Thousands of survivors of the attack had nothing but the clothes they wore, which in many cases consisted of underwear only. These naval personnel had to be clothed, fed, quartered, re-recorded, and put on new payrolls with the utmost expedition in order to make them available for assignment anywhere. There were hundreds of requests for repairs, ammunition, and supplies of all kinds. Calhoun expanded his staff to three times its original size, and despite the excitement, confusion, diversity of opinion, uncertainty, and shortages of everything, he brilliantly mustered order from what could easily have been chaos. Calhoun, soon promoted to vice admiral, continued as Commander of the Service Force until 1945, and the remarkable cooperation, hustle, and assistance rendered by his command are unforgettable. This was especially true in the advanced areas. Any duty to which the term "service" could be applied was instantly undertaken on demand; this contributed enormously to the fleet efficiency, and, in consequence, to the progress of the campaign. No single command contributed so much in winning the war with Japan as did the Service Force of the Pacific Fleet. It served all commands, none of which could have survived alone. Neither could all of them combined have won without the help of the Service Force. It is deserving of much higher public praise than it ever received, and, most of all, its activities should be a matter of deepest concern and study by all who aspire to high fleet commands. Train, had gathered at Tjilatjap, Java. But there was not security anywhere. 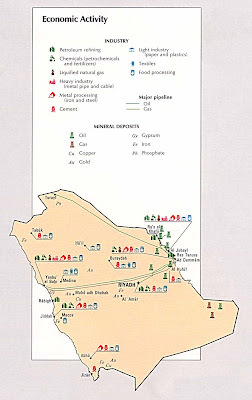 A week later, on 17 February, the Trinity had to go all the way to Abadan, Iran, for oil. 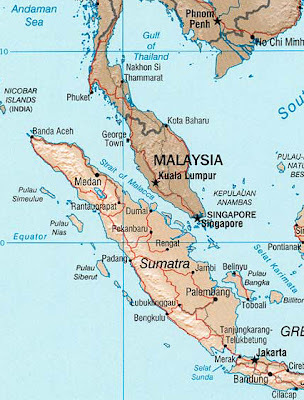 The Japanese had shut off or captured every East Indian source except a very small supply from the interior of Java, so this dangerous voyage of more than 5,000 miles was necessary. The oiler Pecos was also scheduled to refill in the Persian Gulf, but was sunk--with the Langley survivors on board--by the enemy on 1 March, just after getting started for Colombo, Ceylon. These are but early highlights. This work needs to be read and appreciated. I love a mystery: Australian "ghost ship"
A Floating Nuclear Power Plant for Russia? LCS-3 is dead. Long live the LCS! 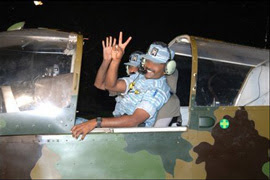 The LTTE (Tamil Tiger) threat to the U.S.
Tamil Tiger air wing a nuclear threat? Iran's seizing Brits? Just a GPS error?